"Best Payroll Product for Small Business!" I love the simplicity/ease of use as well as the variety of functions. My payroll is done, taxes paid, time cards taken care of, and all I do is hit a few buttons. This is such a great addition to our small business. There is NOTHING that I dislike about Patriot Software. I am nothing but a fan. If you want a simple, seamless, easy to use payroll platform that takes care of not only payroll, but guidance in necessary documents, paying of taxes, and even organization of employee time cards, look no further. Patriot Software has you more than covered! Patriot makes payroll seamless while helping me take care of taxes, time cards, and collection/organization of documents that I didn't even know I needed as a new, small business owner. None, and I don't say this lightly. I have used this for a little over six months now. When I have to make adjustments to checks, add or deduct advances or change employee info, everything I need to do is possible. The free trial will tell you all you need to know. You can't beat the price, and you are not sacrificing features for it! We were looking for payroll software that didnt require us to pay 50 dollars or more a month, and one that didnt limit the number of payrolls we could run each month, or limit us only to direct deposit paying. "Better Customer Service and Easier to Use"
Customer support! The chat option is awesome! I love not having to wait on hold for hours. It is also easier to use and don't have to call support every time I need something like making my church clients exempt from FUTA and the ministers exempt from FICA. I can do it myself in the software. The hoops you have to jump thru to set up direct deposit with NatPay are a pain...but again their support throughout the setup process was outstanding! Do it! Fully worth the trouble of switching! I LOVE the cheaper price and as I stated before, being able to handle the exemptions for my church clients in the software without having to call support has saved many valuable work hours. "We are SO glad we switched!" Ease of use, and PRICE! I can't believe the AWESOME service I've received from Patriot customer service - WAY better than what I was receiving from PayCor! The set-up and transition from one to another was super quick and easy! I have been using it for 2 months and have not found anything that I dislike. It has been all positive from the moment I called about a free trial. Don't hesitate for a minute! Do it! Reports, Budget, Functionality... I am solving the problem of having to print several reports to get the info I need to enter into our accounting software. This software provides me with a payroll report that has everything I need. I am solving the biggest problem we had, as a VERY small non-profit, of paying ridiculous fees for our once-a-month payroll runs. Now I can run payroll on a schedule that is convenient for US and it's the same price every month. The new user interface is excellent and easy to use, the support has been excellent and help me fix any errors. I would recommend this for your payroll needs. Got my payroll done from them as full-service, where taxes are managed by Patriot. The online employee portal is very useful and easily configurable, A very cost effective solution for payroll, much cheaper with similar features compared to competitors. I will recommend this to any company considering specially as full-service payroll provider. I have been using this software personally so consider this my personal experience which is very positive and i would recommend this anyone. Therefore, please consider this review to help you decide on Patriot payroll software. Mobile app would be a perfect add-on. Definitely need that. Both employee and employer portal would work wonders for the end user. Specially if time-sheets can be linked there. Other than this there is nothing bad about this software that i can think of. A very cost effective solution for payroll, much cheaper with similar features compared to competitors. I will recommend this to any company considering specially as full-service payroll provider. Got my payroll done from them as full-service, where taxes are managed by Patriot. Lot of time was wasted of mine doing taxes myself, thankfully full-service payroll is perfect for that and I do not have to keep track of tax deadlines which can create issues with penalties. Thank you for the terrific review Nuage. Although Patriot does not have a mobile app, our software has a "responsive design" which means it works on all devices. There is no download or updates needed on your phone like you would need to do for an app, which wastes precious memory on your phone. "Patriot Software allows me to focus on running my business and takes away any payroll issues"
The customer support and setup process are all top notch. Friendly, knowledgeable associates are only a phone call away. Every interaction I had with them helped me immediately resolve an issue for my business. I never have to worry about payroll. The reporting dashboard is a very useful feature as an administrator of the system. The employee portal also meets requirements for receiving paychecks and year end reports which makes administration easy as well. Everything works great with the product. The only issues I have is perhaps the large amounts of menu choices I don't use. Perhaps a simpler interface for what your organization needs only. Customizing User Interfaces is a hard business to be in, but I often found what I needed. In a great future world I would have a payroll AI assistant who speaks to me and holds my hand through everything! 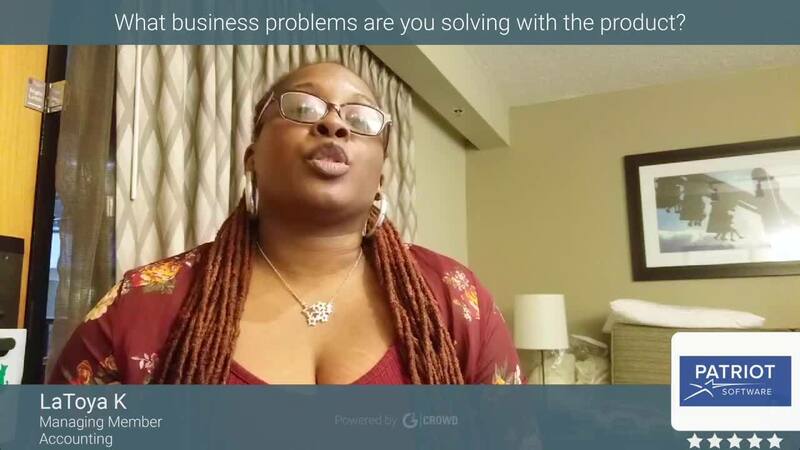 I strongly recommend this product to small business owners looking for an affordable solution to help them get things off the ground, grow your team, and focus on your customers. Focus on providing value, our product and our team. Don't have to spend time with compliance, schedules, and checking small details. Patriot takes care of it all. Easy to use and very affordable! I am still amazed that it can do all of the payroll filings and deposits for this price! I wish it had an import function to bring in employees information and past paychecks. For this reason, I don't recommend it to clients with more than 10 employees. Highly recommend for small businesses, but probably not ideal for larger companies. Payroll is a huge huge headache, I have seen so many disasters from clients trying to do it on their own. Patriot make it affordable to have it all handled, all clients have to do is add in hours or salary! "So far product is as described"
Patriot Software is a simple and easy to use program. Setup time was fairly quick. Just had to have the basic business info available. Definitely helped with the service being able to process the actual tax payments to include state. So far there are no real cons except the normal I would like to pay less for the full service of having the software process and file my federal and state for less. I might look into exactly where and how to file these on my own to reduce the cost but overall no issues or real Cons yet. So far the product is living up to its claims. When implementing the program just have all the basic documents needed: FEIN, Tax docs, business establishment. Other wise everything is pretty simple to include adding new clients. Currently meeting the needs of processing payroll. The product has helped to ensure the correct amount of taxes are being held out and then the payment of those taxes to federal and state agencies on time. "Best payroll service for small business"
Patriot does everything you need, just the direct deposit (third party) process a little slower than others(ADP), otherwise it is perfect. Actually I do recommend the quick pay than direct deposit in this case. "great customer service, price is 80% less than what we paid our previous service adp." The support is very effective. Implementation went very smoothly. The procedures for entering hours and and applying deductions are straight forward. The user interface is clean and very intuitive and reporting is flexible. This is a cost effective solution for small companies as long as you do not need extensive job costing integration into an accounting system. The direct deposit functionality is very restrictive. They require that the payroll be processed by monday to be in the employee's account on friday. They use a third party to do the direct deposits. (with adp you can do it right up the the day before payday) I think they need to address this to accommodate a more and more paperless environment. also if you make a mistake on a payroll deduction you cannot go back and edit the deduction after you have entered hours. you have to delete the entire payroll edit the deduction and then re-enter the payroll. very clunky. the alternative would be to approve the payroll void the incorrect check and then re-run another payroll. A good payroll solution at a economical price. No need file payroll tax returns and make deposits. Patriot software is very easy to setup and use. The customer service is great and friendly, whether using the online chat or talking to someone on the phone. This made my payroll so easy, and it is a lot less expensive than having my accountant do the payroll. There is not much to dislike at this point. I have been using the service for less than a month, so far I don't see any downfall. This is a very user friendly and inexpensive way to get payroll done. Saving me a ton of time and money. I do all of my work in the cloud and am impressed with the functionality and value of Patriot Software's offerings. It allows me to continue working in the cloud without paying the insane payroll costs of Xero/Intuit (per company). I simply bundle the cost of Patriot in my services pricing and get to work for my clients. I think the accounting functionality, while user-friendly for non-accountants, is not as flexible as what Intuit & Xero offer for cloud-based accounting, but the payroll software makes up for it! Always consider the needs of your company or your clients' company before deciding on software. This software does not have automatic integration with the QBO/Xero, so it adds a step that could leave room for errors, but the lower cost for great service is so far well worth the one extra step. Always consider the needs of your company or your clients' company before deciding on software. This software does not have automatic integration with the QBO/Xero, so it adds a step that could leave room for errors, but the lower cost for great service is so far well worth it the one extra step. Because I work with a lot of churches, the paid staff are usually only a few in number and don't need an expensive monthly payroll subscription. With Patriot Software, I am able to offer cloud-based payroll service to my clients and keep my costs low (since I bundle the cost into my total price). They are the most affordable option I could find and they offer excellent customer service. I had SO many questions, and they walked me through everything. I highly recommend them for both the price and the quality. The website is just a little bit difficult to use at first. It could probably be because I am so new at using payroll software, I didn't even know where to begin. After getting help from their customer service rep, I am able to use the website with ease! I highly recommend that you use Patriot software, and take advantage of their excellent customer service! The benefits include: payroll is kept track of, I don't have to calculate the taxes to determine how much to pay my employees each week, and they even file my taxes for me! I liked how easy and fast it is to pay employees, its faster than doing an online wire transfer! And, I love how quick I can get an answer to questions when using the chat feature offered on their site. They are on Eastern time and I am on Central time, sometimes I have a question at night, and I wont be able to get an answer until the next morning. They offer free set up, and I got my first month for free. I say, try it out, you won't be disappointed! They are so easy to use and so affordable. Its the most convenient pay roll option I have in order to process payroll for my employees. Other companies offer MUCH more for the same process. I have noticed how quick they are to respond during the set up process - via phone, email, live chat, they are always there to help. They don't annoy me like other payroll companies do to get your business. As an accountant who prepares payroll for a couple dozen clients I've used at least half a dozen payroll products over the years. I recently moved my entire client base to Patriot. I've found it to be a solid, affordable solution. I like the fact that it leaves me in control of my client's payroll. Support has been excellent and has been extremely receptive to a couple suggestions/requests I've made. I'm looking forward to a long, mutually prosperous relationship. I'd prefer to see data entry forms be a bit smaller/more concise to ease data entry and a couple data entry locations are not where I would have expected them--just took a little getting used to. Because most of my clients are in Ohio, municipal income tax withholding is a big issue. Being able to specify separate mailing and work addresses would be really helpful. The majority of my clients are churches and ministries who have clergy employees. In the current iteration, housing allowance has to be manually entered each payday; however, following a conversation with my support guru, I'm happy to say Patriot is working on a permanent solution. Other solutions might be a bit slicker but few can match Patriot's combination of capability and cost. Check it out. The payroll solution I transitioned to a year and half ago started out great but things went rapidly downhill over the past six months. I had to make an unexpected/unwanted change with not much lead time. Patriot was a very pleasant discovery. "Easiest Payroll Service out there"
I like how easy and fast it is to do my payroll now. I also love the chat feature, whenever I have a question I get an answer in a minute or less without having to waste time calling them. I also like that all I really do is put in the payroll hours and everything gets done itself. When adding an employee it is also very easy everything is well organized. I can easily look at my past payroll reports of any employee or any date in less than a minute. I also love that I can print my employees W2s on my own. I am very please with Patriot Software. It is hard for me to say I dislike anything but if I have to say one thing which isn't even a big deal to me is the paycheck format, I wish there was more options. 2 years ago when I first asked about it they mentioned they would be adding different formats eventually & they still have not and I really wish they would meet costumers requests on that. Try it, it even has a free trial. If you are not satisfied (which im sure wont be the case) you can easily cancel the account before you get charged. I now take half the time i used to doing payroll. It has saved me a lot of time. It has also helped me be more organized because they offer printed reports. "Easy Payroll Sofware at a Great Price"
I like that we had two options for payroll service and that this software can just have payroll and not other services we don't need. We had an easy time setting it up and got help from a very patient customer service representative on the parts I had questions about. We ran our first payroll and were amazed and pleased that it was so easy and is going to save us a lot of money this year. The payroll history was a little tedious to enter but that is because we are starting in the second quarter of this year. No fault of the software company just necessary for tax filing purposes to be accurate. They offer a thirty day free trial. We know we already like it and will continue with it. We chose the complete payroll service and they guarantee the accuracy on their end as long as you have entered everything correctly. This is saving us time and money. We are finally able to do in house payroll in a simple manor. It is not complicated like I was afraid it was going to be and this is freeing up some added income that is not going to an accountant this year. "Makes a Difficult Task EASY"
Ease of Use. Really great. I am new to processing Payroll, and the software does a wonderful job of guiding one through everything. The Dashboard is easy to navigate, the built-in Help is very good, and Support is responsive, friendly, and thorough. I am a new user and have no issues at this time. Very happy with the software. For ease of use, Patriot Pay gets high marks. I also found their customer service superior to Intuit (Quickbooks Payroll). The software allows you to export payroll in a format that can be imported into Quickbooks. I have been paying a CPA to process payroll, and it was very expensive. With Patriot Payroll, I can do it myself for a lot less money. In addition, I now have a much better understanding of what is involved, how it all works, and what it actually means to "do payroll." Until I started using Patriot, it was all a mystery to me. "Finally Payroll Service for a Good Price"
I have a small business with two employees. I was with the two major names in the payroll world for the past 5 years. After hearing about Patriot I decided it was time to save money. My monthly payroll expense decreased substantially, meaning more money in MY pocket. Although I do a experience processing payroll I decided to have Patriot pay my taxes. For the price I'm paying now it's well with it. The system is easy to use and the customer service is top notch. I called a few times during set up and they walked me through my problems. haven't found any issues yet. Although I am a new customer, I have been impressed with what I've seen so far. Save money by switching to Patriot without reducing the quality of service. Over Priced payroll, Patriot has drastically reduce my payroll expense without sacrificing quality. "What a timesaver and stress reliever!" Once the account is set up, all I have to do is log in once a month to run payroll. Running payroll takes about 5 minutes and I am done. Plus, as a paid subscriber Patriot collects and files all of the state and federal taxes and submits them on time. The cost is so affordable and less than some of the other national services that I looked at. I couldn't be more pleased. The website was a little daunting at first and sort of difficult to navigate. I highly recommend calling in and allowing them to walk you through the initial set up. I did not do that and I probably should have. Other than that, I love it. You won't regret it. Their customer service is phenomenal. I have more time in my day to focus on the business because I am not spending time trying to make sure I'm on top of the human resources and payroll areas. There's a peace of mind that comes with knowing that professionals are filing this paperwork for me and I don't have to worry about doing it wrong. I love how eady ot was to setup and how it walked me thru every step making sure I didn't miss anything. The price is a little high... They really need to understand a small business is under 10 employees not 4. Very easy to setup and use. Walks you through the steps and there is someone online to answer questions. I don't have to worry about making tax payments. They are collected and paid for me. "This payroll system is very user friendly." Patriot Payroll is user friendly, so all our employees can use it easily. And direct deposit feels like such a luxury, that alone is worth it! You can also have access to all your pay stubs and W2s online. Overall this system is very convenient. So far nothing comes to my immediate attention. You must have an internet connection to sign in. Having a reliable, third party payroll system makes paying employees/ getting paid simple. Nearly all employees utilize direct deposit. The best benefit is 24hr access to information from mobile log in. "Patriot Software saved me time and my business money!" The support staff was well informed, patient and instructive. They helped me learn the process of creating my payroll, providing options for payment solutions. Their efficient instruction helped me navigate both my federal and state liabilities. I had NO negative experiences with the company! This group was perfect for my small, seasonal business. They helped me with not only my weekly payroll but with tax issues as well! Patriot Software helped me modernize my payroll and settled several tax related issues for my business. "Payroll is now the easiest thing we do"
Patriot handles everything payroll related, including payroll taxes, without worry or hassle. The layout is modern and easy to use. Excellent customer service. Nothing. We decided not to use the optional accounting add-on. But the payroll side is great. I tried out several different solutions for payroll. Patriot was the best I tried, and I continue to be extremely happy with both our results (money not a factor), and our quality-for-cost ratio. Payroll and payroll taxes can be a very time-consuming and frustrating task. Using Patriot, we pay less than doing it ourselves, and it's all very simple. Payroll is now one of the easiest things we do. "Excellent Payroll Service with a Great Value!" Patriot has been so simple and easy to use as our payroll service. We are a small business with just a few employees, and we have the Full Service subscription which is such a great value for the low cost. Patriot takes care of turning in all of of our payroll taxes. I've only had to contact Customer Service one time with a question about adding a Salary Employee, and the woman was so helpful and helped me take care of it right away. I'd recommend this payroll service to anyone with a small business! The only drawback is that Patriot does not offer health insurance packages through their service, like competitors do. Highly recommend this product to anyone with a Small Business that does not need to have a health insurance service offered with their payroll. We needed a simple and easy service, and wanted the service to also take care of turning in all of the payroll taxes for us. Patriot does just that. I use this for my small business, and it makes payroll really simple. I signed up to get direct deposit through NATPAY, and this makes that very easy to do. Their pricing is some of the best around as well. There aren't any advanced features (such as adjusting social security or medicare withholding manually), but if you have standard payroll needs and want to make your life a little easier, this product will probably work fine for you. Not many advanced features, less customizable than some, Interface to access past payrolls can be a little clunky. Quickbooks export is extremely basic and doesn't comply with DCAA requirements for a chart of accounts. My payroll is less of a chore than it was in manual Quickbooks. "Simple, headache-free payroll for busy office managers"
I love how simple and intuitive Patriot is. I have a lot to think about everyday as the office manager of a solo attorney law office, including bookkeeping tasks, billing clients, acting as a legal assistant and other office tasks. I'm glad I can rely on Patriot to calculate and pay taxes and file my tax documents so I don't have to juggle all the due dates doing it manually would entail. Everything is extremely satisfying, to be honest. The interface isn't particularly aesthetically pleasing, but I don't mind. Take advantage of the free payroll set up to make it even more user friendly. Attempting to remember all of the filing dates and procedures of payroll and employer's taxes was a nightmare. I was so relieved to discover an affordable and functional solution in Patriot. "Patriot Software is the accounting and payroll software for you!" 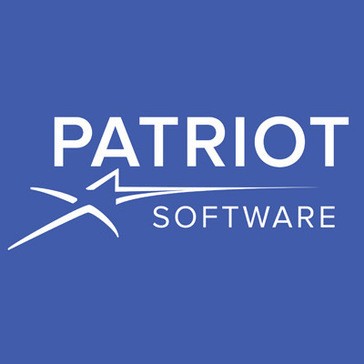 Patriot Software is an affordable, easy to use software. Support staff is friendly and easy to reach. If your small business is looking for accounting and/or payroll software that is headache free and easy on your budget, I highly recommend. The only downside is the that they operate on eastern time and I'm on pacific time. If I need to speak with customer service after 2:00pm my time, I am not able to get live help until the next day. It just requires to adjust my workflow a bit. With that said, they offer very detailed online help which includes video tutorials. Don't hesitate to give Patriot a try. With their generous free trial, you have nothing to lose. I needed to reduce the time it was taking me to handle our accounting and payroll. Patriot Software has streamlined my efficiency. "Patriot Pay helps managing payroll easily!!!" Patriot pay helps with managing the Payroll. It has everything you need to manage your Payroll online. As a startup I tried using a couple windows based offline Payroll app and that was really a pain. But later on I was recommended for using Patrio and I started using it. Patriot has surprised with all functionality it has. I would say 1 of best software to use for financial things. Also my data is on the cloud and being backed up all the time. That is a great advantage. I have not found anything wrong with this software yet. But since i used a few offline app in the past, I would prefer if Patriot Pay can also launch an offline app and keep syncing data with online database in the background. If offline app is available then i do not need to worry about working on payroll when I can not find connectivity of internet. Well, I would recommend this for small businesses. I have around 15 people working for me and it's best software to use. I am not sure how it will work with a number of people but for small business it works great! I have been using Patriot for my company Payroll management. I have a small team and I wanted to manage their payroll using this software. I have seen great benefits of using this software. Patriot is managing all complex things itself and I do not need to worry about losing any data. "Fantastic Product with Full Services that Surprised Me"
I love that the software takes care of all of my payroll filing needs without any additional hassle. I also like that the staff are ready and willing to assist me if I have to adjust something in payroll taxes or cannot find a form. It took a while to set up, but he product is nails. This product does all of my quarterly filing, takes care of my payroll deduction and utilizes automatic deposit options to do so. This product saves me time in filings, money in postage and paperwork handling, and saves me a bunch of money every month over the other payroll products i have tried and used. "This is the easy button for my job." It organizes everything for you. Pay the taxes and does the paperwork too. Easy to use . Friendly help available on line . I took a class on using the competitor and after the class was still not sure how to use it. We found this and no class needed it does everything the others do yet it is so user friendly. It has given me more time to devote to other areas of the business like customer service So our business has grown since we purchased this . "Saved me time and money and stress"
It is easy for a non-accountant to figure out and they have online help as you set it up. Perfect payroll for my small law firm. The online help was available and answered my questions as I set it up too. Nothing that I can think of--but then again I do not do accounting nor do I do software. For me it seems perfect and affordable. It is good for my AZ law firm with only one employee. I kind of wanted to use a bookkeeper but then decided to do it this way to learn more about my and my businesses finances and I am glad I have so far. Taxing through payroll has been streamlined and has saved me an immense amount of time. It also has alleviated a lot of stress and I did not have to deal with government entities too much because the information provided was thorough. I still have to send a report to the state even though all my unemployment taxes a prepaid quarterly via Patriot. "I reviewed many payroll systems and decided on this product because of the ease, customer service an"
Easy to use and understand. It has saved me hours of work, stress of getting payroll done and takes care of all the payroll needs. I wish the time off feature could be easier to understand. I have struggled a bit with this and it should have employer capability to delete entries. I have no other faults with this program except the time off, vacation feature. This should be improved. Call and have your list of questions, mine have always been answered and the online chat feature is great! Reduced stress, Allowed more time to concerntrate on other issues and the employees love the access to their info, time off, print their paystubs, etc. "So much easier to use than I expected"
The ease of navigation through the site was so user friendly. I really liked how quickly I had everything set up and ready to go. The cost was great for the all that you get aswell. That it took me this long to find this program. No really there is not anything negative that i have found, maybe that to catch up for YTD from before I had the program I had to individually go back and enter every week, maybe there was an easier way but I couldn't find it. I t was just a bit time consuming. "Payroll process simplified! Way better than Paychex! " I really like the simple interface, and the fact that I see in real time all of the withholdings, etc. This is minor, and a bit picky, but I feel like I should put something down. Having to deal with a separate company for Direct deposit is a bit of a hassle, but only during the initial setup period. Patriot's software really allows me to have direct access to the information all the way through the process. I can make simple adjustments for expense reports, 401k adjustments, advances, etc. It is super simple to use and they make tax forms much less daunting. Not much! There are some tax changes that could be summarized a little easier or more clear. Definitely try a free trial and chat with customer support if you have any questions. We are a new company and I am having to learn how to do Payroll on my own, for the first time. This program makes it super easy to learn the ins and outs of employee pay requirements. Direct Deposit, Employee portal, payroll taxes, affordability, customer service is always very nice. I didn't find this sooner. The most difficult part is setting up the direct deposit, but i'm a dinosaur that still uses a fax machine. Don't wait! make the switch now! My employees can now check their pay stubs without bothering me. I don't have to take any time out of my day to get that information for them. I have also been able save more time and money. "Patriot Payroll software is very effective and powerful for the cost. " The software is not very complicated and allows me to handle all my own payroll requirements with little effort and hassle. Currently they have a few features which i would like to see implemented like multiple different hourly wages for the same employee. But they have assured me that they are working on these issues. I would recommend that you try it, they are very friendly with free trials and stuff of that nature. I am using Patriot Pay to streamline and reduce my Payroll costs. As a small business this is a huge thing for us. "Excellent payroll software for the price"
24 hours a day would be good to have chat support but we don't pay much so it is ok for now. I love the low cost and they file all the returns and are responsible for any errors they make. I t could not be easier. I really liked the check list they provide to make sure you've submitted all the forms. The time card integration with payroll makes pay day really easy. I liked that they followed up with some calls and some emails when I left some things unchecked. Their website isn't the most intuitive thing on the planet, but with some use, I've figured it out. I'd definitely recommend it. For the price, it's perfect for what I need. I put off hiring just because setting up payroll seemed like a daunting task. Patriot told me exactly what forms I needed to fill out, which ones to keep on file, and what I needed to go forward. It was SO easy, I'm confident the next hire will be even easier. They handle all my tax filings on top of payroll and direct deposit for a fraction of the price I paid for my previous payroll company. I love that they take care of all my tax filings. That is a huge load off of me and direct deposit is great for my employees along with an online time card feature. "EASIEST SOFTWARE FOR SMALL BUSINESS OWNERS"
I LOVE ALL THE FEATURES THIS SOFTWARE HAS . VERY EASY TO NAVIGATE AND TO UNDERSTAND .THE PRICE IS VERY AFFORDABLE THAT IS VERY NICE MOST THINGS THESE DAYS ARE VERY EXPENSIVE. ITS EASY ACCESS AND VERY SELF EXPLAINED WITH SUPORT HELP IF YOU NEED IT.I FEEL THAT HAVING ACCESS TO ALL FEATURES IN ONE SPOT IS A GREAT CONCEPT . ITS ALSO GREAT FOR PEOPLE WHO ARE VERY NEW TO ALL THIS KIND OF SOFTWARE. AND WITH SUPPORT HELP ALWAYS THERE TO HELP THATS A GREAT FEELING OF EASE.AND YOU GET ALL OF THIS FOR SUCH AN AFFORDABLE RATE WHICH IS VERY NICE WHEN YOUR'RE JUST STARTING A BUSINESS AND YOUR POCKET BOOK IS ALREADY STRETCHED. I REALLY HAD NO CONS BUT IF I WERE TO PICK ONE THE ONLY I WISH IS IT TO ALLOW ME TO DO FULL SET UP BY MYSELF I HATE HAVING TO CALL AND SPEAK TO SOMEONE .I PREFER FIGURING OUT MYSELF AND IF I NEED HELP I WILL CALL.. I ALSO WISH YOU DID NOT HAVE TO UPGRADE RIGHT AWAY BUT IT DOES MAKE YOU UPGRADE RIGHT AWAY TO BEABLE TO CHECK OUT SOME FEATURES I THOUGHT ALL FEATURES SHOULD BE CHECKED OUT DURING TRIAL. I WOULD RECOMMEND TO GIVE THIS A TRY VERY EASY TO USE AND VERY AFFORDABLE. I NEEDED PAYROLL FOR MY ONE EMPLOYEE AND I NEEDED SOFTWARE TO BE ABLE TO TRACK ALL PAYROLL FOR THE YEAR. I CHECKED OUT THIS SITE AND LOVED ALL THE FEATURES AND DECIDED I WAS HAPPY WITH RIGHT AWAY. I AM GOING TO TELL MY COLLEGES ABOUT THIS SOFTWARE. What I like most about Patriot is that they are giving the company an ability to relieve the stress from filing & paying for employment taxes, in a state specific manner. My clients are busy enough with their business functionalities. Most of my clients ask that as their bookkeeper, if I can process their payroll. With Patriot, the stress of ensuring all the proper forms and payment are completed in a timely manner just make my job that much better! "Easy to use, and a great fit for my small business"
New site, has some bugs that need worked out. I imagine this will be address via customer service in a prompt manner as has every answer I have posed to them. Needs a direct deposit option. I do not print checks and currently am using a bank for my direct deposit, would like to only use Patriot for these needs. 1099 for vendors and eventually payroll. It is a one stop shop for managing my business payroll. We do offer direct deposit through a third party vendor. Feel free to reach out to us and we will help you get started with the process. So far nothing. I had to sign up for various things through city/state, but Patriot gives you a guide in how to do that. Really wasn't much of a problem. When I did get something wrong they reached out to me and then we fixed it over the phone. Don't put it off. Just go for it. Having an employee that is legitimate. I don't want to have an employee where i run stuff under the table. It is nice to have a legitimate workforce. We are a brand new business and the thought of running payroll was so terrifying for me! When we found Patriot we were so grateful for all of the services they provide to make things much easier. I feel confident that they will file everything for me and it really takes a load of our shoulders. Also their customer service is unmatched. I was contacted by my account rep several times to notify me of additional support and services.. it wasn't too overwhelming as I've experienced with other companies. Definitely recommend Patriot! "Encourage small business owners to save dough and ride the band wagon with Patriot Software"
n/a. I personally am very fond of Patriot Software and love the dashboards, reports, payroll portal and administrative setup including the ability to add or edit employees. "No turning back! Running payroll is now a breeze, rather than the chore." Ease of use and the ability to run payroll, view reports and access the program from any computer, MAC or Windows. I love their customer support. No waiting on hold for excessive times, and always able to speak with a person, rather than leaving a message. I haven't found anything that I dislike so far, but I've only been using Patriot Payroll for 8 months, and I'm self-employed, so with only one employee, my experience is limited. For me, I use their full service payroll that always files/pays my taxes and reports on time, thus freeing me of those time consuming tasks. "Great solution for my practice consisting of small businesses with shareholder employees"
Software is easy to use, help section is very well organized for any questions on functionality. Very prompt and responsive customer support. Any issues are dealt with promptly. It could have some limitations for specific unique taxability issues for states / local. Has some limitations on manual adjustments of taxable wages, etc. However, it seems they are continuously improving, for example recently adding S-corp shareholder employee health insurance premiums as an option for the W-2. Very simple, easy to use. Great customer support. Ease of use, frees time up for other value adding services. * We monitor all Patriot Payroll reviews to prevent fraudulent reviews and keep review quality high. We do not post reviews by company employees or direct competitors. Validated reviews require the user to submit a screenshot of the product containing their user ID, in order to verify a user is an actual user of the product. Hi there! Are you looking to implement a solution like Patriot Payroll?